Introducing new products to a global and diversified market can be a daunting task. We can help you bring your products to market on time – while controlling costs and quality. From concept through mass production Medicologic is your proven end-to-end consulting partner. In today’s market place you can only stay in front of the competition by constantly developing superior new products. Medicologic’s dynamic R&D team will – through knowledge, experience and innovation – ensure your success. Assuring the right quality in all aspects of your business is vital for your company’s image and success. We know the medical device business, and can help you ensure the right quality setup. Ensuring that your company complies with all of the regulations and laws pertaining to your business can be challenging. We can help you find your way round. 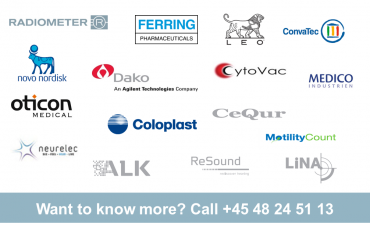 Our experience in management of medical product development projects and our technological background will help you reach your targets. 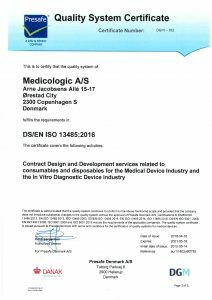 Medicologic has a well-structured development process and we guarantee that we deliver according to relevant legislation as we are certified according to both ISO 9001 and ISO 13485.